As the United States prepared for the likelihood of war in 1940, Harley-Davidson was tasked with building a general-purpose motorcycle for the US Army. Based upon their existing W-series bikes, the resulting bike used a high-compression twin-cylinder 45 cubic inch (740 cc) engine. Over 90,000 examples were built between the WLA (US Army and WLC (Canadian Army). 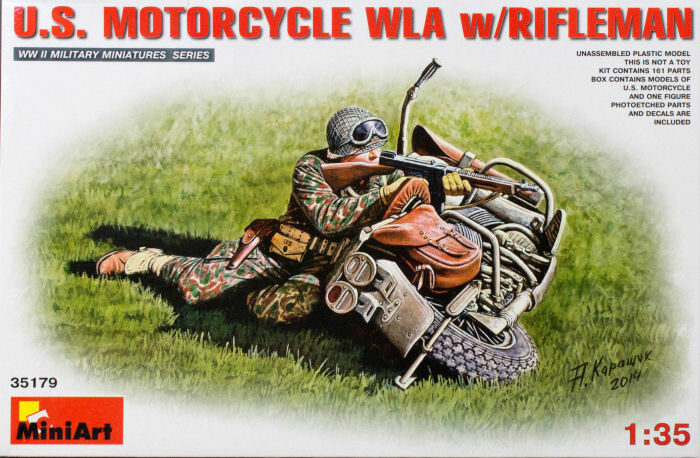 MiniArt is back with another version of its Harley Davidson WLA wartime motorcycle kit. This kit is molded in light gray styrene and presented on two parts trees plus one tree of clear parts and one fret of photo-etched parts. There is quite a bit of detail here just for this bike. Construction starts with the wheels and each tire consists of three parts that laminate together. The spokes are photo-etched parts that are pressed into a jig that is included in the kit to properly shape the angles of the spokes from the hubs to the rims. The two-cylinder 740cc engine is next and I'm quite surprised how many parts go into replicating the engine. The only things missing are the spark plug wires. With the engine together, the bike frame, axles, fenders, gas tank, seat, cargo rack, and front fork all come together. The kit also provides a scabbart for a Thompson machine gun, saddlebags, windscreen, and kick stand. One figure is included, a soldier posed taking cover behind his bike and shooting back at the enemy. The box art depicts an interesting camouflage pattern on his uniform, but the details are consistent with standard US Army issue as well. The kit title suggests this figure is a rifleman but he is shooting the Thompson submachine gun. If you were in a firefight hiding behind a motorcycle and shooting the Thompson, you were in deep trouble given that the Thompson is a short-range weapon meaning that the adversaries were already too close. I might replace that Thompson for a Garand or M1 carbine which would make the scene a little less desperate. But then again, paraphrasing SecDef Donald Rumsfeld, you go into the fight with what you have, not what you wish you had. This is another nice kit from MiniArt and their figures really make these kits worthwhile.